We have received an extremely generous donation of £1480 from our good fiends at Tickhill Lions. This money will enable us to take two local children with special needs on an amazing holiday this Easter. 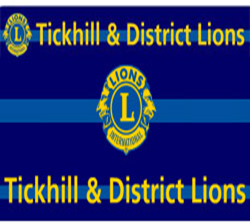 Tickhill Lions have generously helped us for many years now, and we say a big thank you on behalf of everyone in the group. You can find out more about the work Tickhill Lions do by clicking here.